Two rough, tough springers out on a moorland ramble! 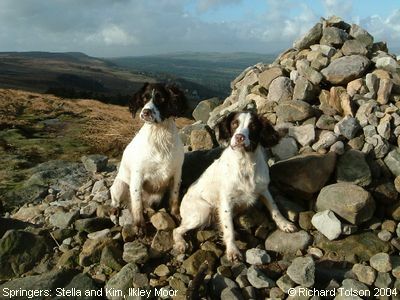 This beautiful photograph was taken on Ilkley Moor in February 2004, and sent to me by these young ladies' owner, Richard Tolson. Stella (on the left) is 9 months old, and Kim (on the right) 11 months - cousins, with just 8 weeks difference in age.